On March 18, members of the National Federation of the Blind of Texas Coastal Bend Chapter will give back to their community by volunteering at the local food bank. 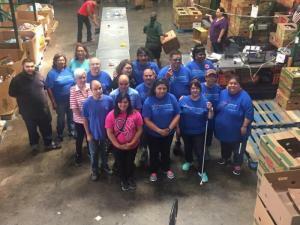 Chapter President Tommy Rodriguez and dozens of other blind people from the area will support the worthwhile work done by the food bank, but their efforts at giving back don't stop there. From now through April 15, they will also be collecting, packaging, and delivering art supplies to the Driscoll Children's Hospital. The Coastal Bend Chapter knows that blindness is not what holds them back, and every day they change negative attitudes about the abilities of the blind. They welcome any blind person who wants to join in that effort. They also welcome donations to the art supply project. They are collecting art paper, crayons (8 packs), and Ziploc bags to hold the supplies. If you can help with their effort, please reach Tommy Rodriguez by e-mail at trodriguez@nfbtx.org or by phone, at (361) 238-0145. If you know someone who would like to join the group in that mission, suggest that they join the chapter at its next meeting, scheduled for April 15. They can learn about how the Federation raises expectations for blind people, and they can help put together art packets that will benefit the Driscoll Children's Hospital. To find out more about the meeting time and location for this chapter, please visit the chapter's web site.